It's about time that we have a network media player to rival the picture and sound quality of a Blu-ray Disc. The WD TV Live Hub is a stunning performer that comes close. The newest media player in Western Digital's WD TV Live line has been named the Live "Hub" because it is more than a network media player. It is also a media server with an internal 1TB hard drive. You can use the WD TV Live Hub as a dumping ground to store media, rather than using network attached storage (NAS) or an external hard drive for your network's central media library. Like its predecessor, the WD TV Live Plus, the WD TV Live Hub can access Netflix, YouTube, and Pandora. The Live Hub adds Blockbuster On Demand (Sling TV) and Accuweather; stay tuned for another content partner to be announced shortly. • It has stunning picture quality and crystal-clear surround sound. • It shows up as a hard drive on your home network, making it easy to drag and drop files or export directly to it. • The remote control has quick-access buttons and programmable number buttons for creating shortcuts to files and folders. Web UI lets you control the device from any computer, smartphone or iPad in the home. • The user-friendly menus are customizable. On-screen messages help explain actions needed and when to take them. • It's easy to find and play the files you want through search, autoplay, favorites list and queues. • You can post photos directly to Facebook. • You can't play copyright-protected files. • The device freezes when stopping Netflix playback; one might expect that a future firmware update will fix the problem. UPDATE: A new WD TV Live Hub unit was tested with another home theater system. Netflix worked as it should. The cause of the original glitch was not discovered. • An error message occurs periodically, even though the file format is compatible with the player. • It is still slow to show thumbnails from large photo libraries. • The media player is not ready to use straight out of the box; it comes with no cables, no HDMI, no composite cables, not even an Ethernet cable. • It has no direct Flickr account access. Whether looking at photos or watching a movie, the WD TV Live Hub's picture and sound quality is impressive. From the first button I pressed to play a high-def movie trailer (included), it was clear that this player is heads above the previous Western Digital devices, as well as most other network media players. The picture could only be described as stunningly bright and detailed; the surround sound was equally clear and full. The Live Hub can rival ​Blu-ray Disc quality when playing 1080p Full HD video files in .mkv, .mp4 and .mov formats. Standard definition video sources were also surprisingly impressive. Digital copies of movies I had previously loaded to my computer were bright and detailed. The Netflix standard definition videos were grainy but bright. The WD TV Live Hub can play just about any type of file in your media library. As with the WD TV Live Plus, a compatible file would occasionally not play; instead, there would be an error message stating that the file was not supported. What sets the WD TV Live Hub apart from the other WD TV Live products is its 1TB of internal storage. The Hub is a media server as well as a media player. With 1TB of storage, you can save full music collections, thousands of photos and up to 120 movies. 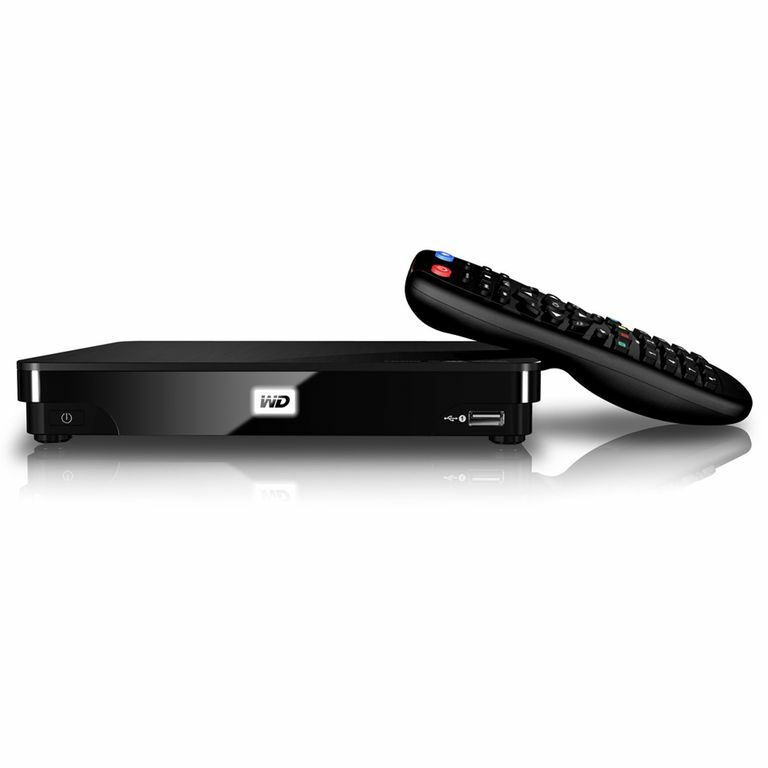 Yet when connected to your network, the WD TV Live Hub appears as any other media server or hard drive. You can export and save or drag and drop files directly to the Live Hub without any special software. The WD TV Live Hub can be set to automatically sync with a specific network shared on another computer or media server; when you add photos, music or movies to that file, they are also copied to the Hub. This is convenient because it is automatically creating a backup of your media files and you can turn off your computer and still access the files on the Live Hub's built-in (local) storage. A number of features help you find the media file you want. The search function looks for files both on the local storage and on your home network devices. While you should always rename a media file so that it is easily recognizable, the Live Hub has Autoplay to quickly see a preview of a highlighted file. Autoplay previews the photo or album cover or starts playing a movie in a small window when you hover over a file. To further help you browse large media libraries, you can filter and sort files by simply pressing the green button on the remote control. To find your favorite files, press the blue dashboard key on the remote. Along with Netflix, YouTube, Pandora, Live365 and Flickr, they've added Accuweather, Facebook, and Blockbuster on Demand to the WD TV Live Hub. The WD TV Live Hub offers a near-complete Facebook experience. While viewing any photo, click on the options button to upload the photo directly to Facebook. View a slide show of your friend's Facebook photos. All of the usual Facebook features are easy to find through the same bottom carousel menu as the home screen. However, it is tricky to find where to go to update your status; you must go to Newsfeed and highlight "What's on your mind?" Likewise, YouTube and Pandora are rich with all of the usual online features. You can like or dislike, rate and comment on videos. To buy or rent movies, Blockbuster On Demand has been added to the WD TV Live Hub. Stay tuned for an announcement of another online service to be added soon. However, there was a glitch in Netflix. When stopping the playback of a Netflix video, the screen would go black; the device became unresponsive. The only remedy was to hold down the power button to turn it off, then press the power button again to turn it back on. This solution worked every time, but I expect that Western Digital will come up with a fix in a future update. As the WD TV Live Hub powers up, you'll notice the difference immediately. A beautiful photo greets you as the home screen background. Media categories and menu items line the bottom of the screen in a carousel. The choices are obvious. The unit comes preloaded with photos from 3 creative masters to use for the background. Western Digital showed attention to detail as they included biographies ​on the photographers. If you prefer to use one of your own photos as the background, you can change it anytime by pressing the options button when viewing the photo you want to use. Likewise, the menu's appearance can be customized as new themes become available from members of a Western Digital online community. Rarely can I say that a media player's remote control is a true asset. The WD TV Live Hub's remote is exceptionally well thought-out and straightforward. Colored buttons let you access sub-menus to filter, change from local storage to network media folders and servers, change from file lists to thumbnails, or access your favorite files. You can even customize the remote buttons to create other shortcuts. The colored buttons can be assigned to a category or folder; the number buttons can be assigned to a specific song or folder. Unfortunately, it was not evident how to assign the buttons to files. You can add folders or files to your favorite list. You can add folders or files to your queue. You can filter your music with the green key. If you are looking for a network media player and/or a network media server, this should be at the top of your list. The WD TV Live Hub does a great job of both accessing your network media and acting as a central storage location from which you can stream media to other computers or media players in your home. Stunning quality pictures and sound, fast performance, tons of options to organize and find your media, Facebook uploads, and lots of content will make this a central addition to your home theater. Update 12/20/11 - New Services and Features Added: VUDU, SnagFilms, XOS College Sports, SEC Digital Network, Comedy Time, Watch Mojo. Also available, the WD TV Live remote app for iOS or Android. Update 06/05/2012 - New Services and Features Added: SlingPlayer (Worldwide), The AOL On Network (US), Red Bull TV (Worldwide), maxdome (Germany), BILD TV-App (Germany).